Built-Up Roofing (BUR) or more commonly known to the layman as “tar & gravel” roofing, consists of several plies of #15 Asphalt felt paper (usually 4-5), adhered together with hot bitumen. Another layer of hot asphalt is poured on top and clean crushed stone is embedded into the hot asphalt. The stone is simply there to prevent the sun’s UV rays from deteriorating the asphalt. BUR is heavy and is the most rugged of flat roofing systems. It is not easy to damage a BUR system. Gravel slows the contraction of the asphalt during sudden changes in temperature. Roofs, especially flat roofs, are among the most exposed parts of a building. Therefore proper structural composition is a determining factor for the life expectancy of the roof. In flat roofs with conventional build-up, the thermal insulation is placed above the structural deck but below the waterproofing membrane. Blistering of the membrane: the waterproofing membrane on the warm side of the thermal insulation acts also as a vapor barrier. 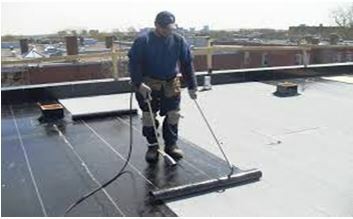 A roof with elastomeric bitumen membrane is used on flat roofs at very high surface (commercial buildings). Hydrophobic, resistant and durable, bitumen has set the standard for waterproofing since Antiquity. A natural and noble material, bitumen is still at the cutting edge of technology today. Developed to reduce the level and maintenance of uniform quality of the seal, it is composed of a base layer and a finishing coat of colored granules in the asphalt surface to protect from sunlight. EPDM is available in large seamless sheets up to 15.25 m wide and 61 m long (930 m²), resulting in fewer field seams for large surfaces and short installation times. EPDM remains highly flexible even at temperatures down to -45°C, enabling year round installation. The membrane can also elongate over 300% to accommodate building movements and temperature fluctuations. Environmentally friendly, has lifespan of 25 -30 years, durable and reliable, improved air quality, Energy Saving, Increased resistance to roof and Acoustic Insulation. 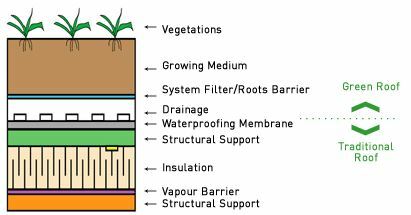 A Green roof system is an extension of the existing roof that involves a high quality waterproofing and root repellant system, a drainage system, filter cloth, a lightweight growing medium and plants.Green roof development involves the creation of “contained” green space on top of a human-made structure. This green space could be below, at or above grade, but in all cases the plants are not planted in the “ground’. Green roofs can provide a wide range of public and private benefits. Development of green roofs involves creating “content” green space on top of a manmade structure. This green space could be below, at or above level, but in all cases the plants are not planted in the “ground”. Green roofs can provide a wide range of public and private benefits. The TPO Roof Membrane is a white single ply roof membrane which is comprised of an elastomeric thermoplastic polyolefin. TPO Roof Membrane is reinforced with high strength, wick resistant polyester fabric. TPO Membrane is a Thermoplastic polyolefin membrane that accepts roof movement and termal shock. It can be used in a variety of single ply roof configurations, such as mechanically attached ballasted. 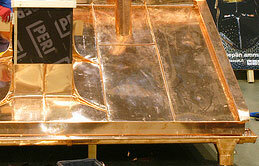 TPO roof Membrane is lapped and seamed using hot air heat welding equipment. 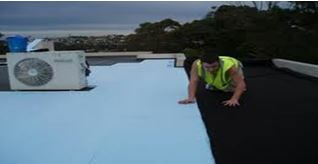 TPO Roof Membrane can be used in situations where other roof systems are not practical. The membrane MM6125 has been successfully used worldwide by leading architects, engineers and owners on all types of horizontal and vertical structures including plazas, parking decks, planters, tunnels, bridges mud slab, foundation walls and roof areas… establishing an unbeatable 40 year track record. The Membrane 6125 stands up to our extreme climate conditions, has been adopted by the best architects, engineers and contractors. The membrane 6125 is a flexible, rubberized-asphalt composite, which is hot applied two to three times thicker than most competitive membrane. This highly resistant, flexible seamless membrane moulds to the most complex, filling or covering even the smallest cracks and ensuring an instantaneous durable and continuous seal. The key to avoiding many roofing headaches is with regular inspections and maintenance.